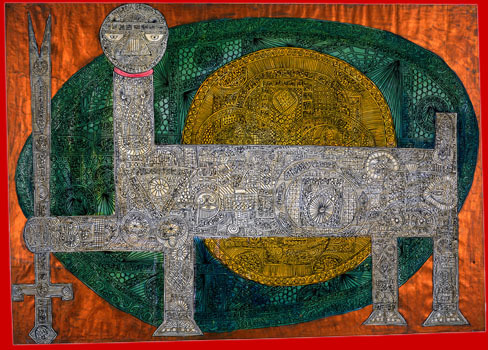 etween Word and Image provided an opportunity to view modern Iranian art and to consider urgent social issues, such as the politicisation of Islam. Cultural histories of the post-1945 Middle East usually describe an uneasy tension between the traditional (often labeled as native, primitive, Islamic) and the modern (seen as imported, mimetic, secular). 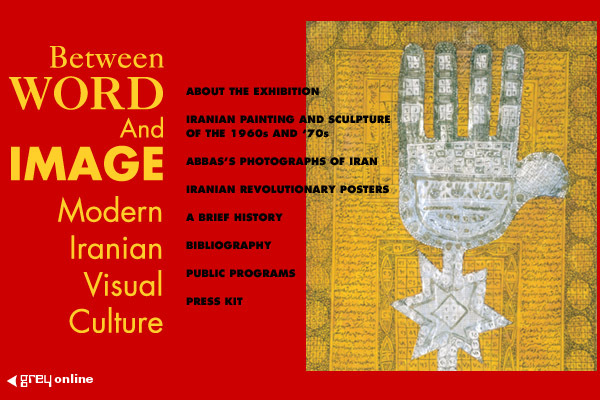 Examining visual culture in Iran during the 1960s and ’70s, this exhibition featured three discrete but interrelated aspects: fine art, black-and-white photography, and revolutionary posters. All served as testaments to creativity as well as records of upheaval and crisis, providing unique insights into the radical transformations that took place in Iran during the two decades leading up to the 1979 Revolution. The exhibition opened with paintings, sculptures, and works on paper, drawn almost entirely from New York University’s Abby Weed Grey Collection of Asian and Middle Eastern Art. During this period, modern Iranian artists increasingly assumed the time-honored role of the poet: acting as social conscience. Appropriating traditional Persian motifs and exploiting the graphic potential of calligraphy – which functions simultaneously as both word and image – they linked ancient and modern, sacred and profane. Also on view was a selection of black-and-white photographs by Abbas, an Iranian photojournalist living in Paris. During the 1970s he made a series of trips to his native country to record the social changes brought on by the rapid expansion of the oil industry. One visit coincided with the outbreak of the Revolution and the photographs he shot chronicle how a popular uprising evolved into an Islamic movement. The exhibition concluded with a group of revolutionary posters produced between 1978 and 1988. Covering the walls throughout Iran’s cities during the uprising and serving as props in street demonstrations, they are composed of bold forms and intense colors – and sometimes feature up-to-the-minute newspaper images by photojournalists such as Abbas – in a potent blend of calligraphy, rhetoric, and politics. Between Word and Image highlighted the many ways in which visual culture both reflected and affected the 1960s and ’70s in Iran. Observing artists grappling with how to reconcile contemporary sensibilities with a rich Persian heritage, we encounter a plethora of visual solutions that transcend the gaps between mimicry and rejection. Their artistic expressions take on greater meaning as our understanding of modernity deepens, and as we gain new insights into the role art can play during times of political crises.